If you think of Mendoza’s Malbec-based wines as rich and ripe but a bit chunky and best for early drinking, try the supremely elegant 2008 vintage of Poesia, a 60/40 blend of Malbec and Cabernet Franc from ungrafted vines planted in 1935. The wine is as fresh today as it was when I tasted it on release several years ago and still has a decade of positive development ahead of it. I’ve been following this project of Hélène Garcin-Lévêque, whose family owns several top châteaux in the Bordeaux area, and her winemaker husband Patrice Lévêque since their first vintage in 2002, and Bodega Poesia’s flagship bottling has always displayed a captivating combination of French savoir-faire and bulletproof Argentine fruit. The 2008 still boasts a deep, bright ruby-red color and its pure, vibrant aromas of black cherry, black raspberry, cocoa powder, graphite and woodsmoke are enlivened by a subtle floral note. 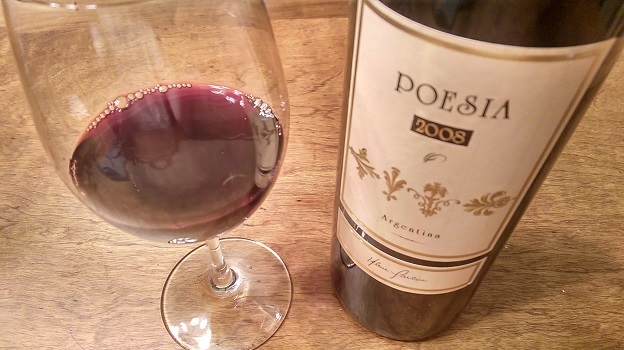 It’s not the most opulent release of Poesia to date, as 2008 was generally a vintage of moderate ripeness for red grapes in Mendoza, but it may be the most suave and best balanced. On the palate, dark fruit flavors are accented by minerals, licorice, fresh herbs and flowers, while the finish features a fine dusting of tannins and echoing juicy length. I was reminded of both Right Bank Bordeaux and youngish Bandol, but with much more pliant tannins than those often fierce Mourvèdre wines. 94/Drink: 2015-2024.